The #OpSaveGaza Campaign was officially launched on July 11, 2014, as a counter-reaction to operation “Protective Edge”. This is the third military operation against Hamas since the end of December 2008, when Israel waged operation “Cast Lead”, followed by operation “Pillar of Defense” in November 2012. These military operations were accompanied by cyber campaigns emanating from pro-Palestinian hacker groups around the world. #OpSaveGaza was not the only recent cyber campaign against Israel, but it is the most organized, diverse and focused. During this campaign, hacker groups from Malaysia and Indonesia in the East to Tunisia and Morocco in the West have been participating in cyber attacks against Israel. Hacktivist groups recruit large masses for their operations by means of social networks. Muslim hacker groups use mostly Facebook and Twitter to upload target lists, incite others to take part in cyberattacks and share attack tools. 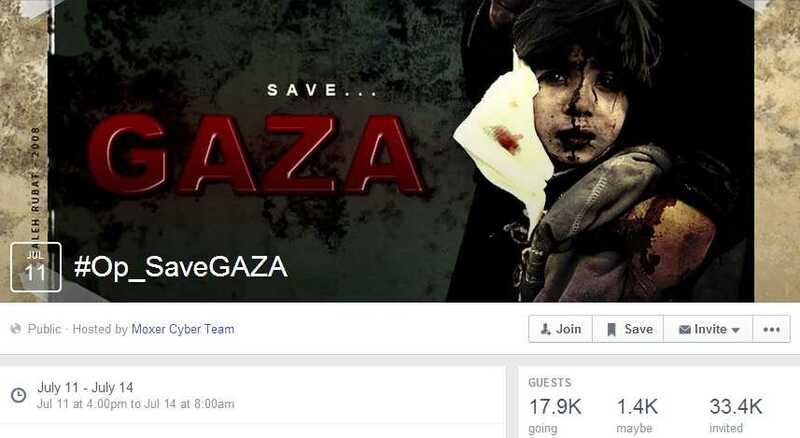 The #OpSaveGaza campaign was planned and organized using these two social media platforms. The organizers of the campaign succeeded in recruiting tens of thousands of supporters to their anti-Israel ideology. When examining the types of attacks perpetrated against Israeli cyber space, it appears that this campaign has been the most diverse in terms of attack vectors. It not only includes simple DDoS, defacement and data leakage attacks, but also phishing (even spear-phishing based on leaked databases), SMS spoofing and satellite hijacking (part of the Hamas psychological warfare), in addition to high-volume/high-frequency DDoS attacks. Furthermore, these attacks have been much more focused as the attackers attempt to deface and knock offline governmental websites, defense contractors, banks and energy companies. Simultaneously, a large number of small and private websites were defaced (over 2,500) and several databases were leaked online. The motivation for waging cyberattacks against Israel during a military operation is clear. This is not the first time that a physical conflict has had implications on the cyber sphere. However, we believe that other factors are contributing to the cyber campaign. In July 2014, the Muslim world observed the month of Ramadan, a holy month in Muslim tradition. There are two significant dates in this month – “Laylat al-Qadr” (the Night of Destiny), the night the first verses of the Quran were revealed to the Prophet Muhammad; and “Quds Day” (Jerusalem Day), an annual event held on the last Friday of Ramadan and mentioned specifically by Iran and Hezbollah. We identified an increase in the number of attacks, as well as their quality, surrounding these dates. Last year, several days before “Quds Day” a hacker group named Qods Freedom, suspected to be Iranian, launched a massive cyber operation against Israeli websites. In other words, we believe that not only hacktivist elements participated in this campaign but also cyber terrorism units and perhaps even state-sponsored groups from the Middle East. The involvement of hacker groups from Indonesia in the East and Morocco in the West. The scope and manner in which this campaign was conducted shows improved capabilities of the perpetrators, which is in-line with Assaf Keren’s assessment of the evolution of hacktivist capabilities.